Over the last decades, the red flour beetle Tribolium castaneum has become one of the most important insect model organisms. It differs from Drosophila in aspects such as extensive extraembryonic membrane formation, embryogenesis and non-involuted head development. The genome is sequenced and a broad arsenal of molecular biologic tools is available. However, fluorescence live imaging has so far been limited. 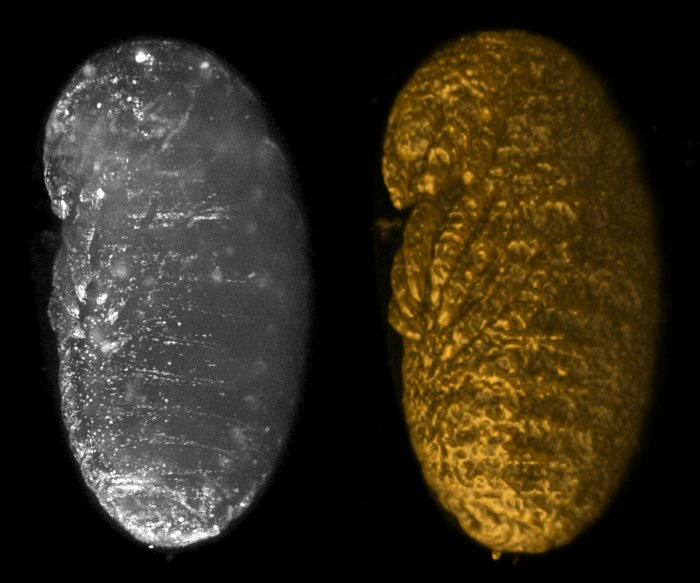 We recently established Tribolium as a model organism for morphogenetic analysis of embryonic development. By using light sheet-based fluorescence microscopy, we were able to perform non-invasive long-term imaging of Tribolium and document all major embryonic events from the rearrangement of the uniform blastoderm to the onset of muscular movement (Strobl & Stelzer 2014, Development). A sample image is shown in Figure 1. Together with Alexander Schmitz, I want to study the underlying morphogenetic processes that leads to formation of tissue or organs and, in the end, the whole organism. Thereby, we follow an interdisciplinary approach, spanning from optical physics over genetics to bioinformatics. Currently, we are establishing Tribolium germ line transformation in our laboratory which allows us to create new transgenic lines that express the fluorophore of choice. Thereby, it is important to choose tissue- and development stage-specific promoters as well as to label the cellular element/compartment of interest. Furthermore, we are applying three-dimension segmentation and tracking approaches in order to define cell lineage trees. Figure 1 - Tribolium embryo after dorsal closure. Embryo shown as Z maximum projection (left) and volume rendering (right). We are actively looking for students (biology, biophysics, and bioinformatics) that want to do an internship or their bachelor or master thesis in the developmental biology division of our laboratory. We will introduce you into animal maintenance, molecular biology, three-dimensional microscopy with light sheet-based fluorescence microscope and data post-processing. When you become familiar with the methods used in our lab, you will work rather independently on your own scientific question and we will discuss your progress on a regular basis.